The Vision Team has been identifying strategies to enhance our ministries that serve our Core Values – as we seek to fortify things we do well and transform things we do not do as well as we could. Through the Vision Team process it has become clear that we need to work diligently to provide opportunities that will be relevant and life-giving both to current members of our congregation and to our surrounding mission field of our community. We cannot settle for “business as usual” if we hope to impact our community and to continue to thrive as Fishers United Methodist Church now and in the years ahead. We must act boldly and courageously. This is in no way a final report of our Vision Team process. It focuses specifically on particular opportunities to strengthen and transform ministries. *Transform our Worship experiences to meet the needs of our congregation and to offer a worship model that is relevant to growing numbers of young adult/family residents of our surrounding community. As we look ahead to the newly redesigned 11:00 Worship Service, we want to help answer questions about what the service will look like and how it will be paid for. To answer the second question, we will be using a combination of grant monies we have received, financial gifts from persons within the church, and also from our annual operating budget. We believe this is worth investing in well as Sunday Mornings are the times we are most regularly together as a church family, and are the days new persons will be most inclined to attend. The physical space, pictured here, is located in the North end of the Family Life Center. This moves the service closer to the "heart" of the church - the Donut Room - and also allows for a more straight-forward entryway for folks entering in Door 4. By locating the service in a more regularly-trafficked location, the hope would be for people to more easily locate the service and feel welcomed to attend. 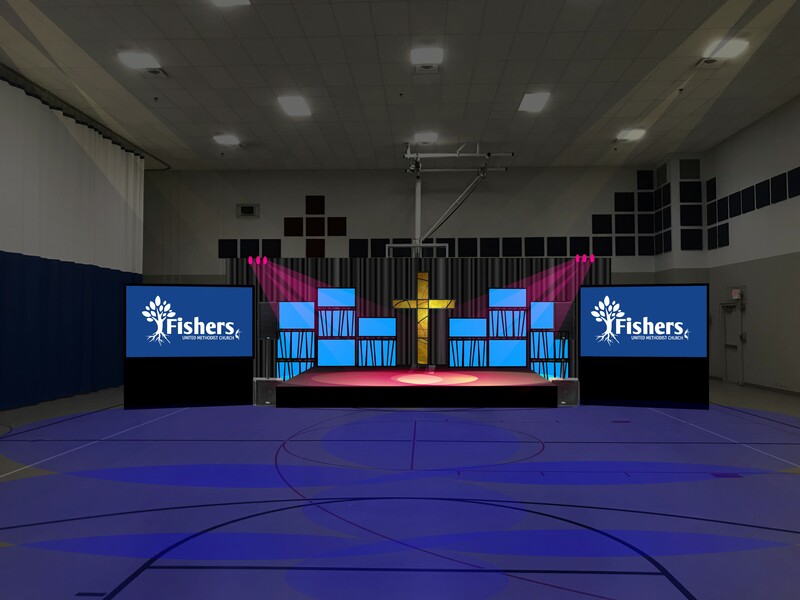 Similar to our current worship services in both the sanctuary and FLC, there will be two screens and a platform. Additionally, a modernized stained-glass cross will take center-stage (an allusion to the beautiful stained glass in the sanctuary). There will be space for 149 chairs set up in three sections. We hope that you will plan on visiting the service on Sunday, both for yourself and so that you will be able to tell others who are looking for a Contemporary Methodist Worship Experience. *Fortify and Transform a Discipleship Pathway for all ages. This past Winter, a new ministry team was developed called the Discipleship Development Team. It is being led by Kim Arnott, with the goal of strengthening existing discipleship groups and to also create new discipleship opportunities. This Spring we launched new ministries like our new Orientation Class (which will be offered again this fall), a new Covenant Bible Study Sunday School (which will be available at both 9:45 and 11am starting this September), and two Financial Peace University Classes that saw families pay off more than $28,000 and save more than $42,000 over the course of just nine-weeks (a net gain of over $70,000)! !We are a church on a mission: to make disciples of Jesus Christ for the transformation of the world. And we know that we become more like Jesus when we connect with others in discipleship groups and engage in daily spiritual practices on our own. We welcome the opportunity to talk with and answer questions at any time. If you have questions please contact Pastors Kevin or Jared or any member of the Vision Team. What will be offered for children on Sunday Mornings? - At 8:30, Nursery and Preschool Ministries will continue to be offered, and Children elementary and up will worship with their families in the sanctuary. - 9:45 will be Children's Worship, with Sunday School classes for 5th-12th Graders. - 11:00 will begin a new Children's Discipleship Hour. For families worshipping at 11, children K-4 will begin worshipping with their families and will be part of the Children's Moment in the service before being led upstairs to Sunday School. All children will be led to Children's Ministry area around 11:20am for hands-on Bible learning. Who will be preaching on Sunday Mornings? On most Sundays, both Pastor Kevin and Pastor Jared will be preaching - Kevin in the Sanctuary and Jared in the Gym. Some Sundays they will switch, and a few will have the same preacher in all three services. What new discipleship opportunities will be offered? The Discipleship Development Team has worked hard preparing new opportunities this fall. A Discipleship Catalog has been prepared with updated descriptions of existing groups as well as new ones like Covenant Bible Study, Financial Peace, Legacy Journey, and Pastor Kevin's new 11:00 class. Communications are also being sent to Class Leaders with options for seasonal studies. First and foremost: Pray! Pray that God would continue leading us - individually and as a congregation. Pray for our community - the 202,000 people who will be living within five miles of our church in the next ten years. Pray that we will faithfully and fruitfully make disciples of Jesus Christ for the transformation of the world. And second: get involved! Now is the time to grow in your discipleship journey and to become an agent of transformation in the church and world. Join a discipleship group, volunteer to lead, teach, or serve on a ministry team. Invite your neighbors, friends, family, and colleagues. Lean in. Now is the time. Contact Pastor Jared , Jordan Vaughn , or Dave Richey David Richey to get more connected today! As the Fishers UMC congregation bands together to make disciples of Jesus Christ for the transformation of the world, we want to show our new neighbors that we are one church with one mission. To help further this perception, we've designed new t-shirts for members of the congregation to wear while performing service out in the community. Help us have enough of the right sizes by ordering your t-shirts below. Home – One Church. One Mission.